Ulrich Minifile - GS Direct, Inc.
Free Dock to Dock Delivery! This upgraded Cadfile holds up to 1,400 drawings, and saves about 60% floor space when compared to traditional flat files. Double-steel walls are fire resistant and durable. Includes unique spring compression system that allows waist-high access from the top...and built-in lock for maximum document security. Convenient snap-out reference shelf provides a temporary work surface. 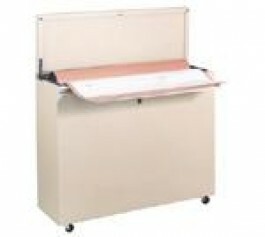 Includes 24 file folders & heavy-duty casters for easy mobility. Choose from 3 sizes. Ships via common carrier. Available in 6 Standard colors, Putty, Medium Gray, Medium Beigh, Dark Gray, Black, Platinum and Desert Sand. You will be contacted to confirm color choice and delivery information prior to the order processing.